If breathtaking natural wonders are your thing, take a quick drive south of Austin to the Hill Country to find the natural geologic treasure known as Jacob&apos;s Well. 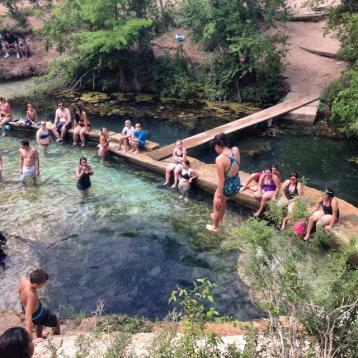 Jacob&apos;s Well is an artesian spring with crystal-clear water that is a brisk 68 degrees year-round. The water is pushed up naturally from about 140 feel below the surface, and the Well itself is the opening (or end point) of a series of the longest underwater cave systems in Texas. Swimming is allowed, but there are no lifeguards on duty, so take note. Reservations are needed May - September. I highly recommend wearing a pair of water shoes because the surrounding rocky area can get slippery, particularly if you are brave enough to take the plunge - swimming right into the Well! Bring some goggles to see directly into to the bottom and the opening of the caves. It&apos;s amazing! If exploring isn&apos;t your thing, you can bring a float and relax in the small shallow stream surrounding the water. The water is about waist deep, and will cool you off on a hot Texas afternoon. There are also picnic tables and places to bring chairs to sit and enjoy the view. If you&apos;d like to explore on dry land, there are several walking and hiking trails, and more will be added this fall and winter. Geocaching is now available on site too! The parking area has a spot with more picnic tables and an office with nice restrooms. From the lot, it is a quick 750-foot trail walk to the Well and water. The staff is incredibly friendly and knowledgeable and offers tours on the history of the area, the plants and wildlife and conservation. Hays County Master Naturalists offer a free guided tour each Saturday at 10 a.m. This is a great place for families to bring kids to explore, and admission is free! Be sure and take note that glass, alcohol, pets and smoking are not allowed in the natural area. Photo courtesy of Kristen Maurel.